The Marsblade Roller Frame complete with Verbero LE hockey boot. The Marsblade Roller Frame with Flow Motion Technology is the only product that truly offers an ice-like skate feel without skating on ice. Improve your on ice performance off the ice. Make yourself a better hockey player. Anywhere, anytime. 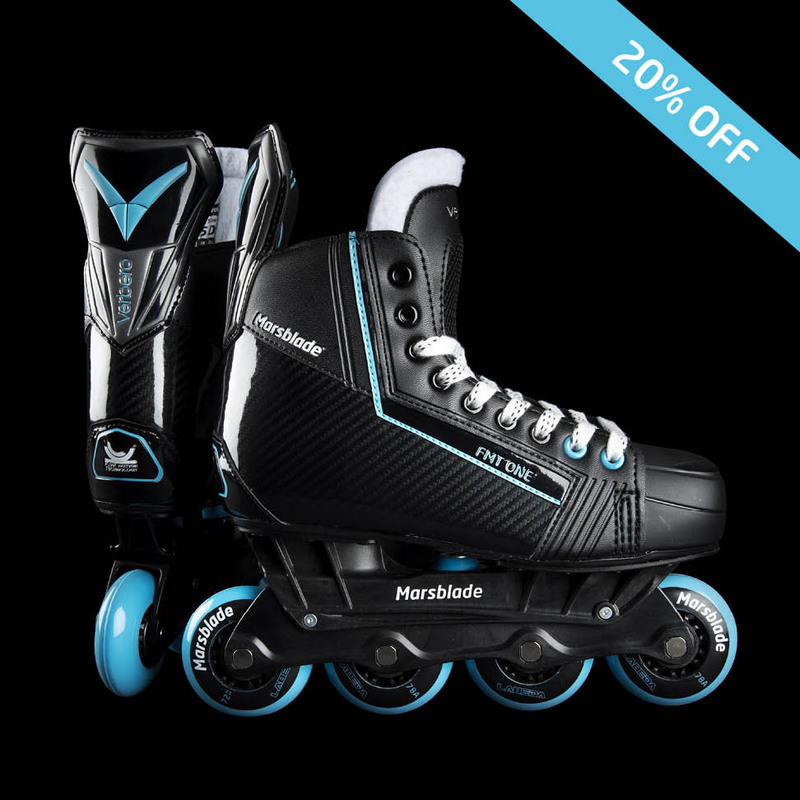 The Marsblade Roller Skate - FMT ONE with the patented Flow Motion Technology rocker gives the same feel as ice-skating. The skate also challenges players balance, core and stabilizer muscles in order to improve their ice skating technique and overall on-ice hockey performance. The ice-like skate feel and benefits such as quicker turns, higher speed and better grip also enhances roller hockey performance. The co-branded FMT ONE and Verbero LE boot is perfect for the intermediate to advanced level hockey player who's looking for a high quality, stiff and supportive boot for effective off-ice training or competitive roller hockey. Fit Guidelines: General fit aspects of the Verbero boot are med-high volume, locking heel pocket, medium-wide across top of foot and forefoot and toe box. Traditional stance. Please note that this boot can also be used with ice holders. What is the Marsblade Roller Frame? The Marsblade Roller Frame with Flow Motion Technology creates a rocking motion that simulates the rounded shape of the ice hockey blade, allowing players to use the same agile movement pattern as in ice skating. The frame challenges your balance and activates your stabilizing muscles to improve your skating technique, prevent injuries and become overall better ice hockey players. The frame also enhances your roller hockey hockey performance and experience as it allows for a longer stride, better grip and better maneuverability. What is the difference between the Marsblade Roller Frames and traditional roller hockey skates/frames? The difference is the patented Flow Motion Technology, a rocker that gives you the same feel as ice-skating and challenges your balance and stabilizing muscles in order to improve your skating technique. Traditional roller skates/frames are rigid and do not give you an ice like feel, in fact, with traditional roller frames your body adjusts to a different stability and skating technique compared to ice-skating. Check out the “About Marsblade” and “About Flow Motion Technology” pages for more information. I’m going to order a pair of Marsblade Roller Frames, what size should I get? Take a look at the size guide and you will find the correct size for you. However, if your skate size is close to 2 different Marsblade frame sizes, i.e. if you are going to attach your Marsblade frames on a Bauer skate size 7.5, then both the Medium and Large Marsblade sizes will fit perfectly. So ultimately it's up to your personal preferences what size to choose, i.e. if your feet are still growing then it could be a good idea to choose size Large so you have a pair that you can grow into. Does the Marsblade Roller Frame fit all ice and roller hockey skate brands? Yes, the Marsblade Roller Frame fits all ice and roller hockey skate brands. If our frames would not for some reason fit your skates, send an email to customersupport@marsblade.com and we will help you out. Is the Marsblade Roller Frame only for beginners/competitive players/talented players/pro players? No, The Marsblade Roller Frame is very beneficial and used by players of all levels and ages, from kids and recreational players to NHL stars. Everyone can improve and fine tune their skating technique and overall hockey skills. Can I play roller hockey with the Marsblade Roller Frame? Yes, of course. We have many customers who use the Marsblade Roller Frame when playing recreational or competitive roller hockey as they find the ice-like feel and the many other benefits such as higher speed, quicker turns, better grip and better maneuverability very beneficial. As many roller hockey players play ice hockey as well, they also value the easy and smooth transition (seamless) when going back and forth from roller to ice hockey. It seems like the Marsblade Roller Frame is made out of plastic, are they durable? Yes, the Marsblade Roller Frame is made of high quality glass fiber reinforced plastic and they are very durable. However, just like any other high-end ice or roller skate holders/frames (both plastic and aluminum frames), Marsblade frames can break do to i.e. a hard slap shot or a slashing. We offer 12 moths warranty if you would discover any production defaults, read more about our warranty here. Can I use the Marsblade Roller Frame and wheels outside on different surfaces as well as indoors? Yes, of course and our high quality Labeda all purpose wheels offers great speed, grip and wear on indoor as well as outdoor surfaces such as asphalt, concrete and sport court. Most of our customers use their Marsblade Roller Frames both indoors and outdoors. If you play a lot on proper roller hockey floor then we recommend you to use softer indoor wheels, however, indoor wheels should not be used outdoors as they will wear out really fast. If you play/train both indoors and outdoors, we recommend you to have 1 set of Marsblade wheels for skating outdoors and indoor surfaces that offers good grip and a separate set of softer indoor wheels that is only used on proper roller hockey floor.